Tweeted by Adam Horowitz, The OUAT episode “Smash the Mirror” on 11/16 will be a 2 Hour episode. Marilyn emailed a picture of Regina’s only friend, except for Kathryn. We know that Emma always wears her jacket as her own personal armor. Tonight she wore soft pink because she wanted to be close to Killian she wanted romance and love. He gave her his jacket. Because she is his girl yes and because now she had a new armor: him. Because he will protect her. Jeff’s thought – Rumpel used Hook’s love for Emma to entrap him to serve him. 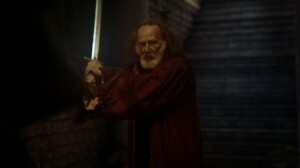 Hook was trying to do the right thing, but it ended up being the wrong thing at the hand of Rumpel. Now that decision can jeopardize what he’s wanted – to be with Emma. I was just thinking of something.. Killian saw Rumple “magically erasing” the tape… It might be a longshot but do you think that’s going to call back to Zelena’s murder and Gold magically erasing that tape as well? Honestly I think the hand was cursed and he did it so he could back Killian into a corner. Because Killian has changed and it’s just like Rumple to do this.. Also this is also the hand he had growing up, the hand that was a lieutenant, he was not a bad person when the hand was taken. It was afterwards that he became a villain. So yeah the hand was definitely cursed, and I think the video is definitely a fake. Look at the man’s house, it was in the middle of nowhere, I don’t really think he would have a security system, and Emma knows Killian why would he attack an innocent old man? Jeff’s thought – Maybe Hook can convince Emma to use her superpower to divine the truth from Rumpel. Honestly I think Rumple was completely lying about the parents, I don’t think they were afraid of her or wanted to take her magic away but rather a way to control her magic. The dark one lies, the dark one tricks. I definitely think Rumple is going to or went after Kristoff because Anna didn’t specify his name and I think Rumple and the Snow Queen will team up and do something to Anna or to Kristoff to put Elsa against them, but it won’t work bc Elsa knows her sister. But I do think the Snow Queen and Rumple had a hand in Anna/Kristoff being missing while Elsa got trapped in the urn. The Missing Year my friend, AKA when Hook lost his love by being transported against his will into another realm, shortly after getting hope for a happy ending with her. He then gave up being a hero and tried to revert to his old lawbreaking lifestyle, but it wasn’t enough and he ended up being miserable and drunk all the time despite trying to act like he didn’t care. …Until he received a sign that a reunion was possible, at which point he gave everything up on the chance to be reunited with her. This is Red Knave’s missing year equivalent – and though Will isn’t exactly at the “love is nothing but endless torment” stage, well… actually he already went there in OUATIW canon. I’m not saying being separated from Ana is the only reason Will’s here or anything, but this parallel seems really big. I mean, add in what you already pointed out with Emma looking like Ana on her date, and Killian’s modern clothes being a lot like Will’s, and there’s no doubt these parallels are intentional. And Emma will be the one to help give Will hope for a reunion and to listen to his better instincts and be his better (true) self. Also a final note: Did you notice the bartender looks like Tony from Lady and the Tramp? Has it ever been established as to where Hook has been staying since he returned sans the Jolly Roger? With Emma’s “I really need to get my own place” line, it started me wondering as to where Hook calls home in Storybrooke. Hook really should have known that nothing good ever comes out of making a deal with Rumple, especially when he threatened to ruin Rumple’s relationship to Belle, more than once. Now he is stuck dancing to Rumple’s tune after he made one too many empty threats and falling for Rumple’s mind games regarding that re-attached hand. I am wondering if they are going to be somewhat following the plot of the original Sorcerer’s Apprentice in Fantasia? If that is so then it is possible that Henry, while going undercover at the pawnshop, will somehow stumble across the magical hat, put it on with good intentions, then have mayhem ensue when the magic that is then released gets out-of-hand as it did for Mickey. Give in to your temptation and turn up the heat, “DO IT!”. Good day Jeff and Colleen, here are the things I learned this week on the episode, The Apprentice. 1). Mr. Gold is a hoarder of limbs. 7). There’s nothing like a Polaroid! libations could lead to trouble. Emma: “There’s no sign of that ice witch yet”. This is the first instance that the Snow Queen has been referred to as a witch. Also, both Mary Margaret and Rumpelstiltskin used the phrase, “speaking of which” in this episode. I love Will and his lines are great but his personality isn’t meshing with the rest of the people in Storybrooke yet. He and Alice played well off each other because they had real chemistry together. She got his humor and knew how to talk to him. We know from Wonderland that he keeps to himself so someone in Storybrooke will need to befriend him before he opens up. Having him hold the picture of the red queen made me realize how much I want to see Anastasia again. There could be some great storytelling by incorporating her into the show. We need some more good guys with magic on the show since the reformed Dark One is slipping. W-O-L-F 98, home of the original party animals. The DJ said the previous song was Left of the Dial by the Replacements. I thought the chorus was appropriate for the situation Hook and Rumple were in. Rip Van Winkle was mentioned by the radio announcer. He was looking for something classic to wake up to. On the radio we also heard the slogan of Granny’s diner, “It’s better than you remember”. Again, we get a glimpse of Thor’s hammer in the background of Rumpel’s castle. Mr. Gold had an amazing redemptive arc in the first half of season 3 but ever since he was brought back to life and held captive by Zelena, it’s almost like it never happened. The scene at Neal’s grave and the countless “I want to be a better man” speeches to Belle sound like a broken record. The previous seasons he’s been motivated by finding his son and changing for Belle but now he’s disrespecting his son’s sacrifice, starting his marriage with a lie and refusing to offer his help to anyone in town. He has become a person who wants ultimate power with no restrictions, for his own personal gain. All of his character development has been thrown out the window as he is now just a typical villain who is no longer relatable. The argument could be made that he was changed after he resurrected or that all of the dark ones have encapsulated his body, drowning out the changed man. Although I do like this explanation, we have seen nothing to bring us to this conclusion. Showing that Rumple wanted the hat in the past as well seems to give evidence that this is all him. Very discouraging to see him this way after all the work he had done to be a better man. If all you want is a cliché evil villain, it looks like you got your wish. Belle deserves so much better. Speaking of Belle, she only had 10 words in this episode. With everything Gold is doing it’s disappointing that there isn’t a greater storyline going on between both of them. I know Emilie de Ravin is shooting a new movie called the Submarine Kid and this could be why they are underusing her and not writing her into a great storyline, then again, this could be the reason why she is working on another project. I really hope her fate is not the same as Meghan Ory, Jamie Dornan and Sebastian Stan. Letting them all go was a real missed opportunity. I know there is a Belle centered episode coming up but this is the same thing they did with Ruby. She would get a full episode to herself and then a couple lines here and there. I know we all would rather have it proportioned out through the whole season instead of just one full episode. Here is a man who is generally trying to be a good guy. Rumple who is ‘claiming’ he wants to be a better man has to be blackmailed just to help Elsa, (Where was Belle, by the way, to convince him?) Maybe Hook took it a little too far when we tried to blackmail him to put his hand back on but Rumple killed Milah so any bad blood between them should be gone. Giving him his hand back but making him believe it had been cursed was Gold just being a (insert your derogatory comment here). He did the same thing to Regina when she was trying to change. He’s that little devil on your shoulder and if he can’t be a better man, he’s going to make sure that nobody else can either. I’ve seen tons of jaw dropping CGI in my day, (not on Once Upon A Time sadly), but when that broom starting walking with it’s little hands moving from side to side like it was on mission, I was awestruck. I felt like a little kid again, seeing a cartoon character come to life for the first time. Plus having the music play along with it was great! All it needed was a bucket of water and my day would have been made. I love Frozen but I’m getting a little burned out on all the references. A couple are fine but when is it too much? They have me saying out loud, “We get it, you’re doing Frozen”. They need to concentrate more on character development and less on trying to figure out where they can fit the Frozen line in this week. I read a Facebook post a couple weeks ago that read if you rearrange the letters in Sydney’s name, you get Yen Sid. It is a strange coincidence, especially since Sydney happens to be back this season. What do these writers have up their sleeve for him? I still hold to my original theory that the Sorcerer is the author of the book. Especially after seeing the apprentice this week and adding more mystery to his identity. I’ve heard that finding the books author will be stretched out over both halves of the season, instead of having two different storylines like last year. A villain who tries to give himself a happy ending while still acting in his evil ways like Rumple, needs to be stopped by a powerful author. The Sorcerer fits this role perfectly. Also, I love the idea of having a good sorcerer who is just as powerful or possibly more powerful than the Dark One. At this point, I want to see the defeat of snarky, manipulative, self serving Mr. Gold. I want the winter finale Gold back. I have nothing to back this up, but what if the last name Swan somehow came from Sarah Fisher. It has never been explained how Emma received this last name. We know Neal gave her a necklace of a swan but it is not confirmed that she went by that last name because of it. She could have already had the name and that’s why he gave her the necklace. Since the apprentice said “Every Dark One has tried and everyone has failed”, it would seem this hat is common knowledge between all the Dark One’s. Could this be because the sorcerer, being a dark one himself at one time, now possesses the hat? What if he refused to be the Dark One any longer and faced his inner darkness and succeeded. Being made pure, he would be released from the daggers control and now be the rightful owner and guardian of the most powerful hat in the universe. I believe that only a truly good man can wield and possess the power of the hat. Gold may be able to activate it but he won’t be able to control it. Just as Mickey couldn’t in Fantasia. Does magic still come with a price when you possess the hat? Please Tweet and Thank her. This entry was posted in Once Upon A Time Fan Podcast Full RSS, Once Upon a Time Podcast and tagged once upon a time, podcast, sorcerers apprentice, the apprentice on October 25, 2014 by Admin of Storybrooke ;).